WANT TO HAVE THE ULTIMATE MOVIE EXPERIENCE AT HOME? 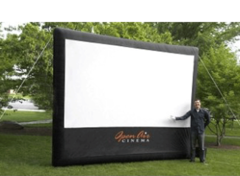 Choose our Inflatable Movie Screen and you get the ultimate theater experience all in your backyard! Our screen is HD quality and has an 18 foot screen! With our movie screen kit you can watch movies, play video games and even sports night with the guys. Basically, if you can watch it to your tv at home, it can be shown on our screen! Please call us if you have any questions! Please call our office to schedule as this item rents for 3 hour events!